WHAT’S A BOTTLE OF COCA COLA GOT TO DO WITH CHRISTMAS ANYWAY? THERE IS A LESSON IN HUMAN CONNECTION MAGIC FOR US ALL. ‘It’s officially Christmas now the Coca Cola advert has been on’. ‘Get the turkey ready, Coca Cola has started Christmas’. We see this every single year. People explode with excitement and festive cheer at this particular advert that sits amongst many other Christmas Ad campaigns. Somehow, this is the one advert that signifies the beginning of Christmas for millions of people all around the world. This is the 22nd year that The Coca Cola Truck (originally known as the Christmas Caravan) has graced our screens with it’s iconic twinkling lights and beautiful red exterior that has swept across many winter landscapes for the past two decades. Every year the ‘battle of Christmas adverts’ heats up, in attempt to capture the hearts and souls of people all over the world. We see the likes of John Lewis and Marks and Spencer produce new narratives to keep the excitement with their brand fresh, new and exciting. Something that really stands out to me about Coca Cola, is how it doesn’t try to re-invent the wheel each year. Rather, the adverts remain pretty similar but somehow they generate excitement like no other Christmas advert. Yes, Coca Cola have one of the biggest brands in the world and a loyalty to their brand globally. However, irrelevant of the product that they sell, their Christmas truck adverts capture emotion, magic, nostalgia and excitement. Coca Cola brings together a global community of completely different people from all walks of life and captures the spirit of Christmas that everyone can relate to in their own way. They don’t necessarily change the advert much each year but what they have done exceptionally well is changed the experiences around their planned main advert narrative and perhaps MOST IMPORTANTLY they have shown that they care. 2015 is a year that really stands out to me in the way that the brand made a huge impact. 2015 was the year that they allowed a member of the public to drive one of the famous Coca Cola Trucks for the very first time. Matt Smith was a tuck driver who was obsessed with the Coca Cola trucks and he reached out to the brand to ask if Coca Cola could make his dream come true and allow him to drive one of their Christmas trucks to help raise awareness for Cystic Fibrosis, a condition that Matt had to battle, day in and day out through his life. Coca Cola made his dream come true. He drove the truck and was magically surprised by Coca Cola when they had arranged a choir to sing the famous ‘Holidays Are Coming’ song once he had finished his drive. I remember reading the words from Coca Cola’s marketing director (at the time) Bobby Brittain, these words encapsulate everything to me. “It’s these moments of happiness that make Christmas Special” – Think about the simplicity of this and what this demonstrates; Coca Cola showed that they cared. They cared about something that wasn’t in their own planned narrative, but rather they delivered an experience that meant something to someone. They created magic and took the time to make a personal connection that mattered to one individual person. Of course, there was a knock on effect of this and publicity naturally came. But what Coca Cola did was to step away from the ‘brand’ to do something that mattered to one individual human being. Very often as business owners we can get caught up in scaling our businesses and becoming so ‘BIG’ in business that we forget that true human connection and experience with us, is what really matters. When technology facilitates that everything moves so very quickly and everyone is scrambling to be heard or seen, the fact is, that small gestures of kindness and really thinking about what matters (not necessarily on a huge scale) but more on one that is meaningful to maybe one or two people really does count. As a brand, Coca Cola did not need Matt Smith to generate interest in their brand, they already had it. Their iconic Christmas advert and Holidays Are Coming campaign would have been enough all on it’s own for them. What they did, was showed that they were human and that being human and caring was what mattered more than selling a bottle of fizzy pop. In a world were everything moves at a million miles an hour and our lives are busier than ever as business owners, many think about how they can ‘sell the next product’ rather than create something more meaningful that really matters. It doesn’t matter how big or small you are in business, an act of kindness, really listening to what matters most to people and stepping back to create a little magic every now and again goes a long long way. 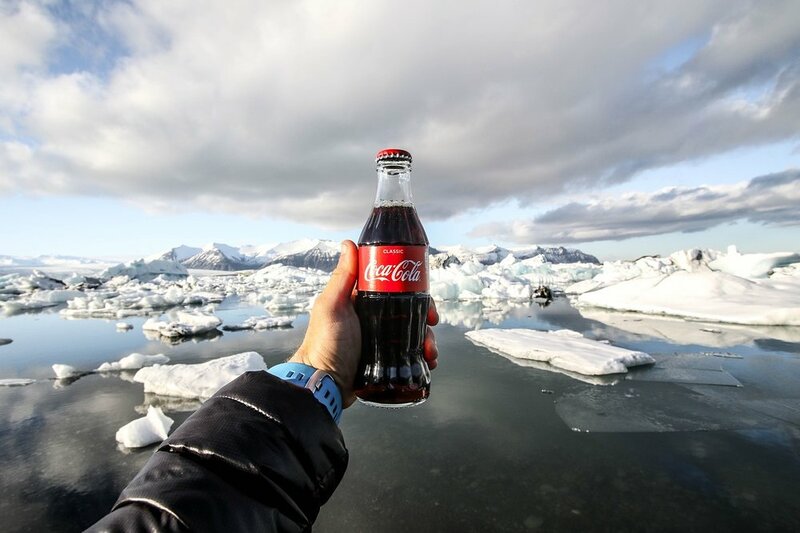 So what does make Coca Cola so successful in standing out in their Christmas adverts each year asides from the beautiful narrative, nostalgia and magic they create? Coca Cola did something that mattered. Irrelevant of what they put out on our screens each year, they captured and continue to capture my heart through the little things that connect with human spirit. How can you create experiences and magic every single time with your business? It is not always in the obvious messaging or creativity, it’s very often in the experiences you create around whatever beautiful creative and messaging and branding you set out with to begin. Don’t forget that people lie at the heart of everything and it’s the little things in business that you take the time to do that matter, because very often you will find that it is those things that touch hearts far more than any of the bigger things you will ever do. After all …. what’s a bottle of Coca Cola got to do with Christmas anyway? I would love to hear your thoughts on your favourite Christmas Campaigns and adverts and why they meant something to you. Please pop me a comment, I can’t wait to hear from you.